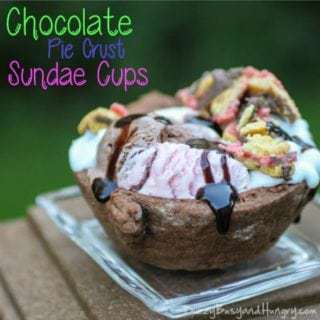 Chocolate Pie Crust Sundae Cups | Dizzy Busy and Hungry! 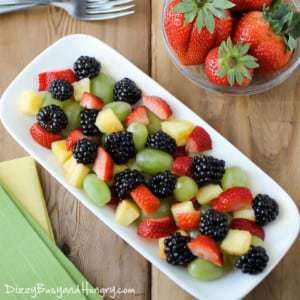 Today’s post is another great dessert from Thing 1. His Chocolate Pie Crust Sundae Cups recipe let you have your ice cream in a dish you can EAT! The kids will love it. Take it away, Thing 1! Though school has started, the weather is still warm and people are trying to find little ways to hang on to summer. One of the first foods I think about when I hear the word ‘summer’ is ice cream. Whether it be in a cone or a cup or all over my face, ice cream is always a cold and sweet way to cool off on hot summer afternoons. With that in mind, I wanted to make a special kind of sundae to celebrate the end of summer, and to try to hold on to it just a little bit longer! 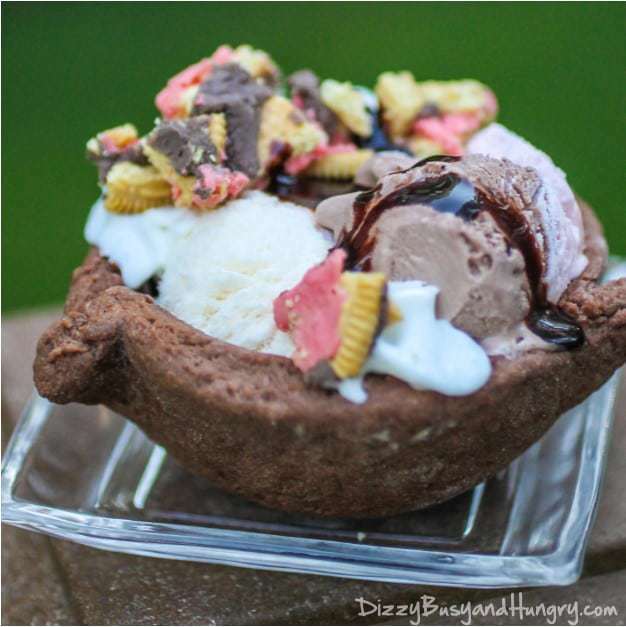 The bowls are completely edible, made out of a special chocolate pie crust that is simple, easy and quick! I used Neapolitan ice cream, and as it turns out, Neapolitan Oreos also exist! Along with whipped cream and chocolate syrup, these sundaes were sweet and delicious and just what I needed. Even better, there was hardly any clean-up! You can just eat the bowl! Of course, you can use any combination of ice cream and toppings that you desire, but I was going for something synchronized and slightly more sophisticated (because ice cream is such a sophisticated food!). So as a new year school starts and with fall just around the corner, you can enjoy a sundae and reminisce about your summer! Thing 1 was inspired to make the pie crust sundae cups from a very creative idea by Tina at Epicuricloud. He read her post on Honey and Peach Pie Sundae Cups and decided to do his own sundae in a chocolate cup. You should head over and check out Tina’s homemade honey ice cream. 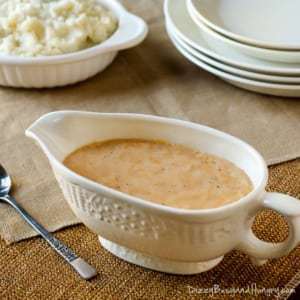 It looks so delicious and creamy! Quick and easy edible bowls to fill with ice cream and toppings, fun to eat and perfect for kid parties or any occasion! Combine the flour, sugar, cocoa powder, and salt and whisk until well blended. Cut in the butter and shortening and combine until the mixture becomes crumbly. Add the egg yolk and water and mix until the dough begins to clump together. Roll out the dough until about 1/4 inch thick. Turn a muffin tin upside down, and place each dough circle over one of the muffin cups, molding it around and pleating the excess so that the dough fits snugly around the cup. Place the muffin tin in the oven and bake for 10 minutes. When done, remove the muffin tin from the oven and let cool. 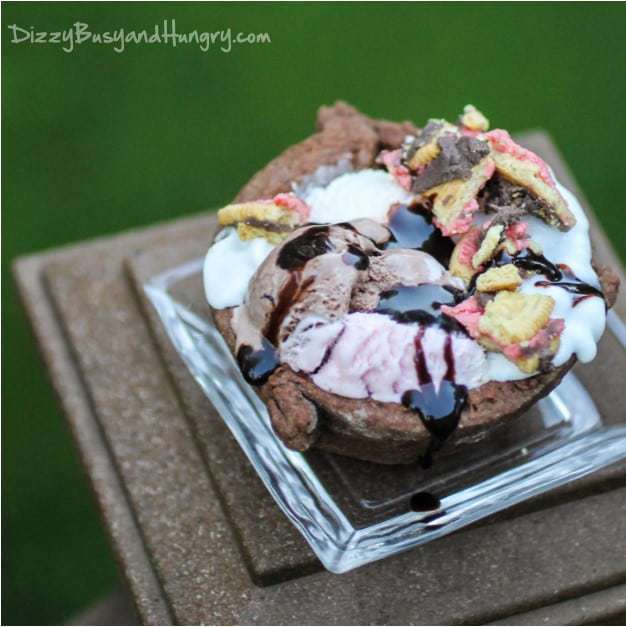 Once the pie crust cups are cool, remove them from the muffin tin and fill with ice cream, cookie crumbles, chocolate syrup and whipped cream as suggested above or your own favs! That pie crust looks like a wonderful cookie! Thanks for sharing at the What’s for Dinner party! oh yum!! 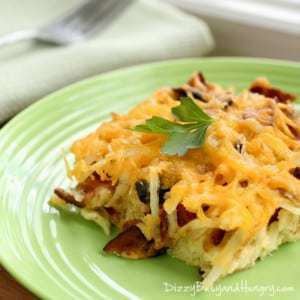 I’m making these for my next bbq~ Thanks for sharing at the What’s for Dinner link up! 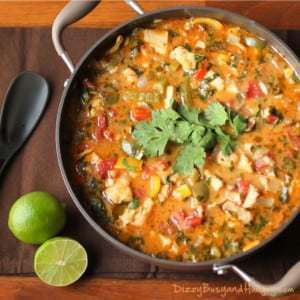 This could easily be my dinner tonight it looks so good! I love these homemade edible crusts. I want one of these sundaes right now! It is true that we try to hold on to Summer however we can, and what better way than ice cream! 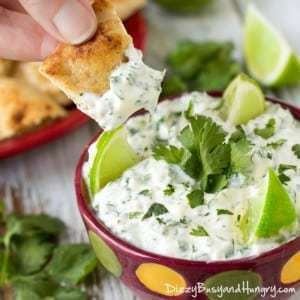 Thank you for sharing on Tasty Tuesdays link party. Shared and pinned. Yum! Thank you for sharing at our TGIF Link Party at A Peek Into My Paradise. Your post will be featured at the TGIF Link Party this week and was pinned to the TGIF Party Board! Oh, awesome! Thank you so much Cathy! I appreciate you stopping by. I will head over to the party when it is up! Those look so good! Thanks for sharing at the Pinworthy Projects Party! I’ll be featuring this on Facebook, Twitter and Pinterest this week. Oh my! The idea of eating an ice cream in a pie crust is awesomeeeeee and is getting me hungry you know??? 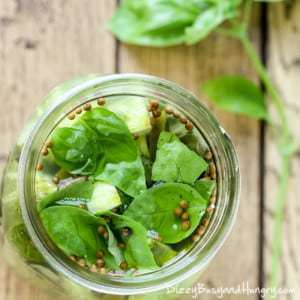 Thanks for this recipe and Thanks so much for sharing this with me at Bewitch Me & Titi! Hope to have you back with more amazing shares! Hope you are having a marvellous week!!! Oh my, these pie crust cups would be perfect for parties. Yum! Pinning! 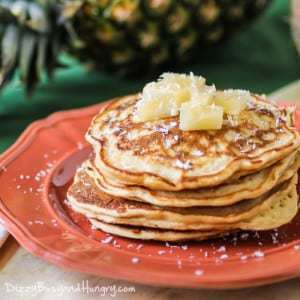 My son would absolutely love this recipe…and so would I! It looks delicious! I’m a new follower from Wine’d Down Wednesday. I hope you’ll come visit me too. Thanks! Thanks, Emily! I hope your kids enjoy them! Fun idea! Ice cream reminds me of summer too. Love the chocolate crust version Thing 1!! Great job!! Looks amazing! !